Building or buying a new home? Strand South suburb is within walking distance of the beach in the town of Strand in the Helderberg area of Cape Town. Strand South is located in between the railway line on the western side (adjacent to Kleinbos suburb) and Hammond Street on the eastern side. It stretches from Broadway Boulevard (north and adjacent to the Onverwacht suburb) to Beach Road (southern border). The Strand South suburb offers convenient proximity to most amenities. A variety of high and primary schools (state as well as private schools) as well as crèches is either inside the suburb or within a few minutes’ drive from it. Three shopping centres is within a few hundred meters from the majority of the suburb’s homes – whilst two Virgin Active Gyms and Strand Golf Club are all located within 5 kilometres from the suburb. Strand’s Blakes Beach forms a part of the suburb. The area in and around Strand South boasts with beautiful sea and mountain views and ample public open spaces for doggie walks or just strolling or jogging along the beach. Strand High School is located in the adjacent suburb of Goedehoop is 1.6 to 4 km away whilst Lochnerhof Primary school is 1.4 to 3km away (in Strand North) and Hendrik Louw Primary about 2 to 3 km (in Strand Central). The Loreto Primary School – a Catholic School – as well as False Bay High School (private school) are inside the suburb. There are a variety of creches available in and around the suburb – with the Die Roosknoppies in Twin Palms the closest. Other well-known creches within 4 km are Bugz4Life, Lochieland, Sprokiesland, Helderberg Kids en SpeelKasteel nursery, pre-primary and after school facility probably the most well-known ones. A variety of private schools are also available in the area – including Reddam House Somerset (4 km), Somerset House Preparatory (6 km), Curo Sitari Independent School (12 km), Somerset College (11 km). The Somerset Mall regional shopping centre with 200 shops is 6 km away and The Sanctuary Shopping Centre - which includes a Woolworths, Pick & Pay and a variety of eateries as well as a Virgin Active Gym, is 5 km away. The Gants Virgin Active Gym is only 3.7 km from Strand South. The Southside Centre with a OK Food Store, an after hour pharmacy, doctor rooms and a variety of take-away food shops such as KFC, Debonairs etc. forms part of the suburb and is on the corner off Gordon’s Bay Drive and George Street. 4 Petrol filling stations are located inside or close to Onverwacht – Total Strand with a 24 Hour McDonalds and B.P Helderberg is in the suburb – whilst Caltex Broadway Boulevard (2 km away & next to a Burger King) and Caltex Careno 1,4 km away. Strand S.A.P.S (Police) as well as Strand Fire Station are located inside Strand South suburb. 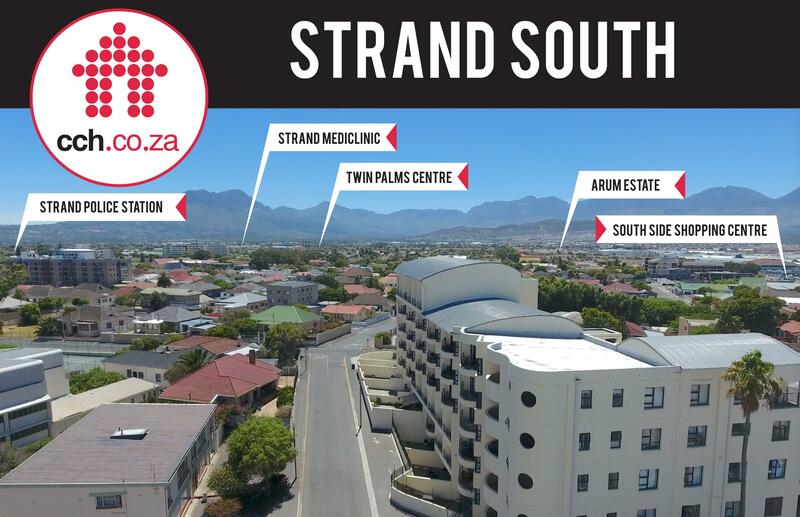 Strand Medi-Clinic as well as well as Spescare Helderberg Sub-Acute are located in Strand South. The Busamed Paardevlei Private Hospital and the adjacent Somerset West Cure Day Clinic are 4 km from Strand South, whilst the largest private hospital in the Helderberg, Vergelegen Medi-Clinic is 4.5 km from the suburb. The average household income range is according to Lightstone between R35 000 to R45 000 - which falls into the LSM 9 Low range with a total of 5 215 adults living in Strand South. The period or tenure of ownership, which is a measure of ownership stability, shows that about 62 % of the existing owners have been owning for 11 or more years, about 5% between 8 to 10 years, about 12% between 5 to 7 years and 22% for less than 5 years. The age profile of the stable owners in the Strand South suburb is fairly mature with 72% of the owners older than 50 years – of which 35% is older than 65 years, 37% (50 to 64 years), 22% (36-49 years) and 6% (35 and younger). The recent buyers’ age profile is fairly spread out amongst the age groups – with 27% (18-35 years), 29% (36-49 years), 32% (50-64 years) and only 12% (65 and older). The Strand South suburb in Strand consist of 1 067 own title or freehold houses which constitutes 36.45% of all properties in the suburb. There are 276 freehold houses in estates (9.43%) and 791 (27.02%) not in estates. There are no sectional title property in estates (0%) and 1 860 (63.55%) sectional title property outside of estates. Strand South consist of 3 areas – Twin Palms, Van Ryneveld and Parks Estate. It has a fairly diverse property offering which includes top-end luxury beach front apartments such as Ocean View, Kuriaki and Atlantica in the Parks Estate area and Blakes Terrace in the Van Ryneveld area along Strand Beach Road. On the other side of the property scale you can find very affordable one bedroom apartments in secure complexes such as Atlanta and Broadway along George Street and convenient freestanding town houses in secure estates such as Il Pallidino and Duck Pond in the Twin Palms area of Strand South. There is a variety of historical homes in the older part of the suburb which is closer to the Blakes beach area in the Van Ryneveld section of Strand South. It is an established suburb which has long reached maturity – with only 27 vacant land sales transaction taking place during the last 10 years. The Van Ryneveld section of Strand South consist of 284 own title and 814 sectional title properties of which the 661 residential apartments forms the biggest part. It is located between Gordons Bay Road & Beach Road (from the circle) up to Norman Street. Parks Estate has 78 own title property (48 homes) and 698 sectional title units (498 apartments) which is located between Beach Road, Faure Marine Drive, van der Spuy and Gordon Street. The majority of apartments lies along Strand Beach Road. Twin Palms is located between Broadway Boulevard (North), Altena Road (West) and Deiningdal Street (South). It has only 2 entrances into the area – both via Constantia Street, which gives it the feeling a smaller and more “closer community”r;. 244 Houses and apartments were sold (registered) in Strand South suburb during the last 12 months (September 2017 to August 2018) – of which 49 transfers took place in the last 3 months. 55 Sales were freehold properties (homes) and 179 sectional title (apartments) sales registered in the Deeds Office during the last year. 2 Erven (vacant land) were transferred in the last 12 months and there have been 5 sales in execution during 2017 and 1 for the year up to August 2018. Property sales (registrations) in Strand South has during the first 8 months of 2018 dropped with about 24% relative to 290 property sales achieved during 2017. Only 147 registrations took place in the period between January to August 2018 - consisting of 104 sectional title properties (apartments), 41 freehold properties (houses) and 2 vacant land sales. This relays to about 18.4 properties sold on average per month or 220 properties on an annual basis. Between 2011 and 2017, an average of 15 properties per month or 182 properties per year sold in the Strand South suburb. There has been quite a positive sales volume growth pattern since 2009 when total sales were 107 properties for the year (about 9 per month) – up to the highest point of 296 properties during 2017 (about 24.6 per month). There have been 147 property sales up to August 2018 – i.e. 18.4 properties sold per month relative to the 24.6 property sales per month during 2017 – which constitute a drop of 25% in monthly sales during the last 8 months. Median prices achieved for Strand South freehold properties has during the last 9 years grown from R740 000 (2009) to R1 360 000 (2018) – i.e. a growth of about 84% or about 9.3% per year. Despite a drop in sales volumes, median prices has for freehold (own title) increased during 2018 from R1 200 000 (2017) to R1 360 000 (Aug 2018) and for sectional title from R762 000 to R975 000 - i.e. an increase respectively of 19.46% (own title) and 28% for sectional title. For more information about the available properties within Strand South, please contact one of our local specialist estate agents.